Your travel guide to Bali, the most popular tourist destination in Indonesia. Also known as the Island of Gods, Bali is rich in culture and history that is still very prominent now with old temples that are still in used, festivals and practices. It is also full of natural wonders too like the white sandy beaches, surfers waves, divers paradise spots, mountains to hike and rolling fields of rice paddies and rice terraces. Bali lies to the east of Java and just slightly below the equator line. It has a population of 4.2 million people and unlike the rest of Indonesia which is predominantly Muslim, it is home to most of the Hindu minority. The major religion here is Balinese Hinduism. 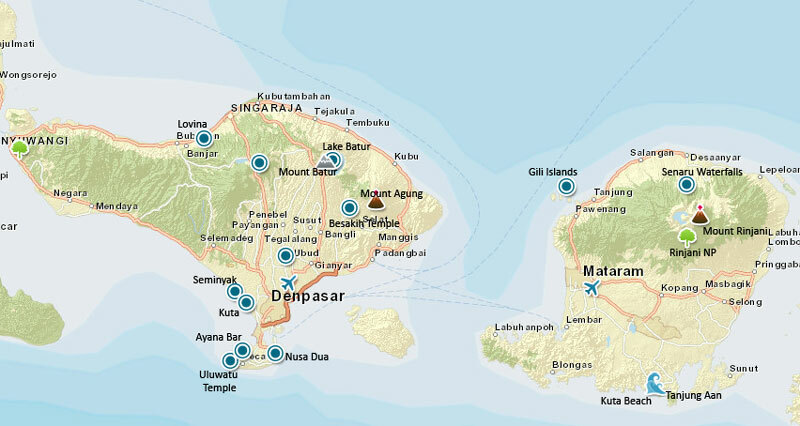 Largest city here is Denpasar with its own airport and the cultural center is Ubud. The epicenter of Bali where all the action is, most of the tourists that come here end up spending most of their time in this area. The Denpasar International Airport is located here and the most popular destination Kuta is located here. Although this region expanded with resorts and malls, village life and homestays are still alive and abound. Nusa Dua – Reputed for having the most lavish beach resort of Bali, people come here for private relaxation along vast stretches of white sandy beaches and indulging in spa and massages. Kuta – The famous location in Bali, packed with entertaining nightlife, restaurants, bars and shopping centers. If you are looking for an action, here is the place. It is also popular for surfers. Canggu – The new up and coming hip alternative to Kuta, fame for its good surf breaks, hipster cafes and beautiful beach. Jimbaran – When one thinks of Jimbaran, it is all about beachside grilled seafood and romantic moonlight dinners, thanks to the numerous beachside restaurants with candlelit tables set on the sand. Truly a unique experience enjoying seafood on the beach with gentle waves caressing your feet in the sand. Sanur – a relaxing beach town down southeast coast Bali, appealing to more matured visitors and family. It offers world-class facilities with serene surroundings, a perfect place for holiday cocktail and time with family under the sun. Nusa Lembongan – Whether you’re looking for amazing surf, stunning views or just some downtime, Lembongan is the perfect destination. Nearby Nusa Ceningan is definitely worth a visit, too. Seminyak – the upmarket section of Bali with lots of nightlife, good beach and resorts ranging from luxury to mid-range. Seminyak restaurants here are also well known to be good. Uluwatu – Home to the famous Uluwatu temple, this serene place also holds many beautiful almost unknown beaches. The island’s heart and soul, home to the well-known city Ubud, that is the darling of all creative and art lovers. If Bali is a canvas, then this is the part where there are big green brush strokes of highlands and rice paddy fields dotted with volcanoes. Ubud – the favourite town of many that is located metaphorically and physically as the center of Bali. It is well known for arts, culture, people and food, with beautiful architectures and many things to do. Some of the temples in Ubud are not to be missed when in Bali. Bedugul – almost a darling secret of this part of the region, with imposing mountains, picturesque lakes, beautiful trekking routes and impressive temples. This cool respite in the highlands is well hidden off the radar of tourists and truly worth a visit as an addition to Bali’s off the beaten tracks. Lovina – a quiet coastal town of North Bali, stretching along 8 km of black sandy beach. This place is famous for its early-morning dolphin trips. Amed – a laidback sleepy town that offers a good respite from the usual hustle and bustle of Bali, dotted with local fishermen along its coast. For those who are looking for privacy and to splurge for a honeymoon or special occasions. With quick access to Seminyak beach, this Balinese inspired accommodation is built on 15 acres of tropical gardens. The Frangipani Cafe inside here is famed for its cuisine. Notable are their open-air massage pavilions and outdoor pool overlooking the ocean. For those who appreciate traditional architectures and design. This hotel, built way back in 1962, encapsulates the Balinese style and spirit. Among the spacious gardens are thatched roofed bungalows, pavilions, sculptures and fish ponds. It also has direct access to the Sanur beach. For those who is looking for unpretentious comfort with Balinese charm. Located in Ubud, our favourite place to stay in Bali, the Balinese style cottages with carved wood furnishings are set in beautiful gardens with a pool. Marriott is a trusted brand for many and this one in Bali lives up to its name. This secured luxury is located just 5 minutes walk to Seminyak beach. A noted feature is its private terraces for relaxation, hence making it a favourite of couples. For the budget conscious, this guesthouse in Sanur is a steal, featuring swimming pools, clean air-conditioned rooms and a simple breakfast. It is located at a quiet place with only 15 minutes easy walk to the beach. Prices starting from only 24 USD!